School supplies, and uniforms are sold on this street the whole year round. Major landmarks: 168 Mall entrance; Manila Textile Market which can be accessed from Soler and C.M. Recto Ave.; 168 Residences that connects to the Soler wing of 168 Mall. Goods on the street: Uniforms and underwear; school supplies and bags; crib sets and household linens; rain gears; bags and accessories; home fixtures. Details worth noting: Soler St. rounds the corner to C.M. 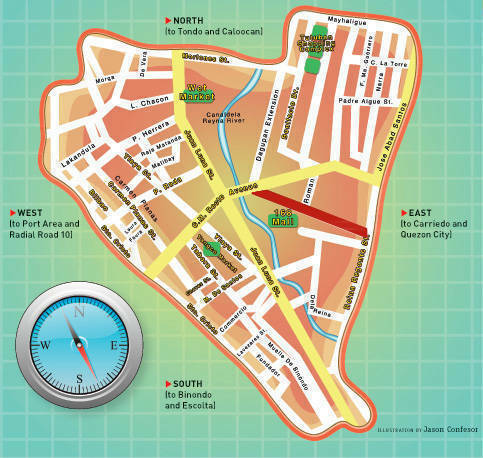 Recto Ave., a major highway where you can take a ride back to the MRT Purple Line or LRT-1.